I would like to bring to your attention the sad reality that the services of Malik Barkat Ali, a prominent member of the legal and political fraternity of the pre partition era, who died on 5 April 1946. He has not yet been given due consideration as not a single road has been named after him. Previously Temple Road on which Malik Barkat lived from 1925 onwards till his death was named after him and the same was than changed. Thereafter Lytton Road was renamed as Malik Barkat Ali Road and this met the same fate. I am deeply grieved to hear the very depressing and sad news of the sudden death of Malik Barkat Ali. He was from the very beginning a true and loyal member of the Muslim League, and on all occasions, he rendered the greatest service to Muslim India. His advice and staunch support on all occasions was of greatest value to the League and myself. Muslim India has lost in him a great man, and I have lost in him not only a colleague, a collaborator, but also a great friend. My deepest sympathies go out to his family in their bereavement for their irreparable loss. He belonged to a middle class family and after a distinguished academic career, joined FC College as Asst. 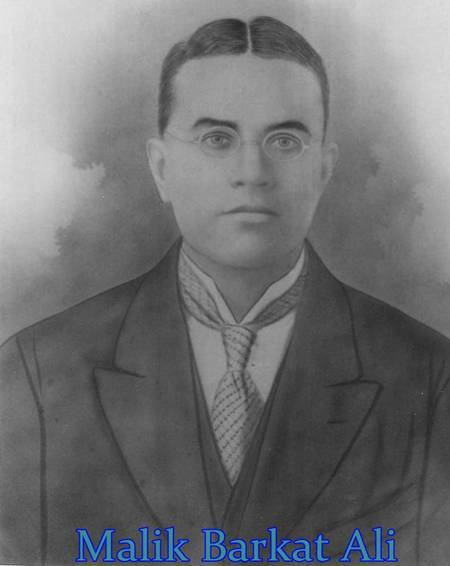 Professor English after doing MA in 1905. He later served in Islamia College. Malik Barkat Ali joined government service in 1907 after competitive examination standing first and completed his LLB classes. While posted at Lyallpur, he developed differences on principles and resigned in 1914. On 13 April he joined English weekly The Observer as editor, which gained him prominence in Punjab politics, since this paper projected the Muslim community. His editorials irritated Governor Punjab O’Dwyer, who asked proprietors to sack him or face closure, but they preferred ceasing publication. On 22 Dec 1919 he enrolled in Punjab High Court and started active politics. He participated in annual sessions of Muslim League held in 1924, 1924 and 1926. He was member Reforms Committee All India Muslim League in Dec 1915 and participated in Muslim League delegation to All Parties Convention called by Indian National Congress at Calcutta in 1928. In 1929 when Bhagat Singh was tried, a resolution condemning trial was moved jointly by Allama Iqbal, Barkat Ali, Nanka Chand and Norang in Lahore High Court Bar. He was an ardent supporter of Allama Iqbal and this association continued till Allama Iqbal’s death in 1938. He was a member of All India Muslim League working Committee for over 20 years, which under Quaid e Azam approved draft of Pakistan Resolution. Malik Barkat Ali was elected on Muslim League ticket to PA from eastern districts of Punjab on 9 Feb 1937. Only two Muslim League candidates were elected, the other being Raja Ghazanfar, who immediately joined the Unionist Party. For 10 years he alone represented ML and opposed Unionist Party. In Lahore there was only one pro League Urdu newspaper Daily “Ehsan” and to fill this vacuum an English weekly “The New Times” was launched which was edited by Malik Maratab Ali, his eldest son, while Allama Iqbal remained its patron. Malik Barkat Ali was again elected unopposed to Punjab Assembly in 1946. Masjed Shaheed Gunj issue created turmoil when it was demolished by Sikhs with connivance of police and army on night of 4 July 1935, with a coalition including Feroze Noon, Muzaffar and Shahabuddin ruling Punjab. Several were killed by police firing and thousand arrested, which included Maulana Zafar, while activists of Majlis e Ahrar abstained. Quaid arrived in Lahore after a gap of 8 years on 21 Feb 1936, on joint appeal of muslims of Punjab. His intervention led to release of muslim prisoners and formation of Reconciliation Committee. Malik Saheb actively campaigned for Masjed Shaeed Gunj issue and on instructions of Allama Iqbal filed a suit with District Judge Lahore, who ruled against them on 25 May 1936 and later filed an appeal in Lahore High Court, which was taken up by full bench comprising of Chief Justice Young, Bhade and Din Mohammad. Barkat Ali and Barrister Coltman on recommendation of Quaid pleaded the case. High Court decided case in favor of Sikhs in Jan 1938 with Justice Din dissenting. Allama Iqbal instructed him to present a bill called Islamic Mosques Protection Bill in assembly. Premier Sikandar Hayat fearing trouble for his government advised Governor to block the presentation of bill. A civil disobedience movement was launched to protest issue of Masjed Shaheed Gunj and Quaid in a letter to Allama Iqbal dated 2 March 1938 desired that a special session of All India Muslim League be convened at Lahore to discuss this urgent matter. Allama Iqbal sent a formal invitation for holding this Special Session hosted by Punjab Muslim League. It is an unfortunate fact of history that the Punjab Muslim League, which was headed by Allama Iqbal had its affiliation cancelled on 3rd April 1938 by a sub-committee at Delhi, few weeks before Allama’s death on 21 April 1938. History is testimony to the fact that this Special Session to be convened at Lahore was never allowed to be held. Malik Barkat Ali was a close confidant of both Allama Iqbal and Quaid e Azam Mohd Ali Jinnah. It was unfortunate that he did not live to see the birth of Pakistan for which he had struggled hard, particularly in the last ten years of his life. After the creation of Pakistan, on the instructions of the Quaid e Azam, Malik Shaukat Ali son of Malik Barkat Ali was second Mayor of Lahore twice elected. He was also returned to the National Assembly. Topic is very touchy indeed. We must remember and tell the young generation about the deeds of our leaders. Thank you for writing above brief elaborating the struggle of Malik Barkat Ali.